The opening round of the Pata European Junior Cup, powered by Honda was, as expected, a close and exciting race. With a leading group of eleven riders locked together throughout, nobody could predict the final outcome. The race was eventually won by Kiwi Jake Lewis, who stole the victory by 0.003s from Spanish wildcard rider Albert Arenas, who had taken pole position yesterday. 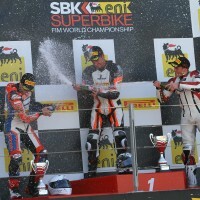 The final podium position went to Italian rider Michael Canducci. French rider Guillaume Raymond just missed out on the final podium spot by finishing 4th a fraction ahead of Ilian Fernandez and Zac Levy who grabbed 6th on the final lap. The top six at the flag were covered by 0.7s. Sabrina Paiuta from Brazil was once again the fastest of the female competitors, at one point making the fastest lap of the race, before eventually finishing in 13th position. The next round of the series will take place at Assen, The Netherlands, in two weeks time.